Week three’s THE X FACTOR auditions saw more original talent and some very unique singers continuing in the cities of Denver, Los Angeles, and Long Island. Some auditions were short a mentor or two, but the entertainment was plentiful. It was especially a great night for the youthful song-birds with contestants as young as fifteen years old. Others put together their own melody’s that included one couple rapping the episode’s closing with one memorable rap. But, first, starting off in Long Island, the first singer of the night was Melanie Wright who idolized an American Idol Carrie Underwood. Simon gave her 2 minutes to change her life, and it didn’t work. Followed by Rob Zarro, and Maya Lehaman none of the three got through. I get X Factor is trying to entertain people but sometimes the bad performances feel to rehearsed, like they know they’re bad. They’re Either Going to Scream, or Boo! Khaya is also 15-years-old. The girl can sing but it wasn’t working. At first I thought she just had no stage presence, but Kelly let her sing another song ‘I Put A Spell On You’ the second time around and she killed it. Every judge had nothing but great things to say, and she blew the roof off the place. Simon said, “I absolutely love you, I love everything about you.” Kelly called her “phenomenal!” Simon compared her voice to Amy Winehouse and Adele. The compliments don’t get better than that! Before Joseph hit the stage, Simon said he wanted to hear something he’s never heard before. Behold 19-year-old Joseph whose talking voice sounded just like Minnie Mouse. Simon offered Joseph his water to drink before he sang. James is a 35-year-old apartment manager from Portland, Oregon who I’m already pulling for. I want him to be good; He’s a family man and just wants to do what he loves to do. He started writing music at age eleven. He was on season one of The X Factor. Simon remembered and wished him luck. More YES votes went to Chase Goering, Allison Davis (26-year-old waitress), Isabel Requena, and 15-year-old Isaiah Alston. He told the mentors, “I auditioned today for my girlfriend. Have you ever done something out of your element for love? Today is like that.” The women mentors swooned and though it was sweet. 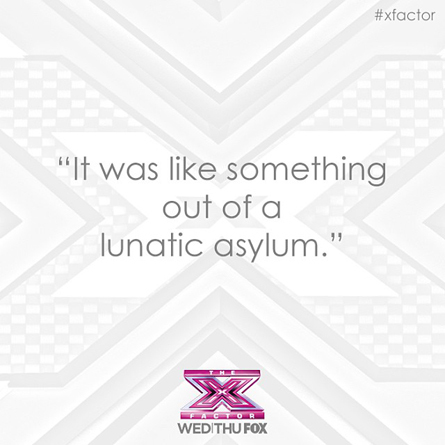 But, David had a different motive for being at The X Factor. Backstage, he told Lauren’s father that he came today to ask for her hand in marriage. Lauren sang ‘Teenage Dream,’ by Katy Perry. She actually could sing unlike her boyfriend who joined her on stage after her performance, proposing to her on national TV! This had all the girls standing, and even Simon was smiling from ear to ear. She said yes, and although she didn’t make it onto the next round. It didn’t seem to matter because they seemed to be celebrating each other. Kelly said, “I felt like your voice just came over me like a blanket of love. I feel you know yourself as an artist and you know your place.” Demi said, “First of all, I got chill and I get it. I don’t want you to be bad. You are so lovable and you’re so cute just the way you are. I think people are really going to love you.” Paulina told him he delivered his heart. Simon said he heard someone singing “A Thousand Years” that was really good. Wesley (19-years-old), an auto parts salesman, who wants to be on Kelly’s team, also has a BIG crush on her. It seems to be more of an obsession while he got on stage and proceeded to (creepily) walk up to Kelly, grab her hand and kiss her. Simon told him he had to go and to “get these impure thoughts out of your head.” He did seem to get her attention because she said her heart was racing. Onto the song, besides everything, Wesley can really sing! He sang “Wanted” by Hunter Hayes. 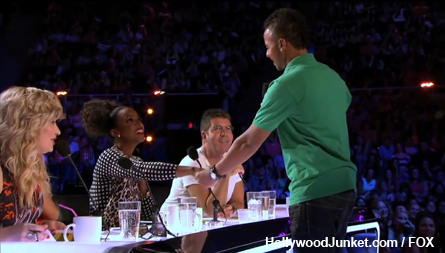 Memorable X FACTOR moment – Wesley walked-up to Kelly and kissed her hand! 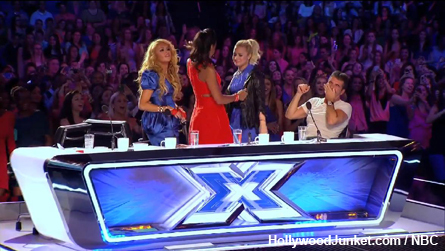 Memorable X FACTOR moment – Simon’s reaction to Wesley kissing Kelly’s hand. Kelly chimed in saying “Okay he’s a Casanova.” Simon said he was actually good. Demi told him “at first I thought you were creepy. But you actually have a very good voice.” All the judges said yes, and he’s moving onto the next round. Demi added to her “yes” for him “not to eat her friend (Kelly). 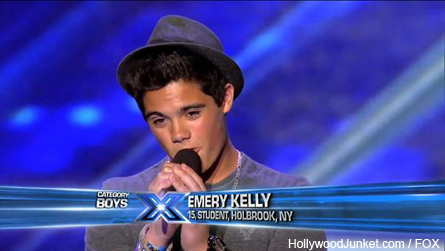 After all his panting over Kelly, Simon told Wesley to take a cold shower before he sings! Next up, 16-year-old Celine Polenghi from Miami, FL who sang exactly like I expected her to. “With huge potential,” as Simon put it. He also said, “I see a future pop star standing in front of me.” She got all judges to say yes. 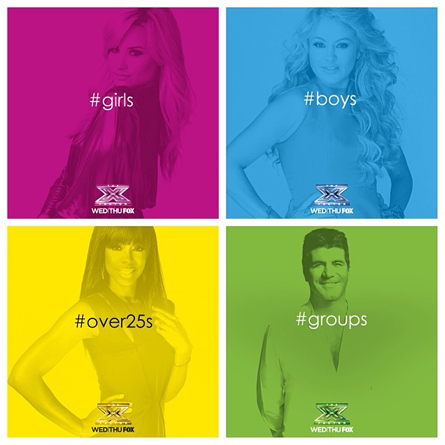 Simon said that the girls are taking over the world! Demi said she wants the girls. Last season she had the “Young Adults.” Thursday night’s episode will reveal what categories the mentors will get. Rickey looks a lot like Usher, and says he knows he has the X Factor, while also proved to have a lot of personality. He has a crush on Kelly and said he love her so much. After crying himself off of the stage, Kelly chased behind him to tell him this show was a stepping-stone, and that she had be rejected on Star Search. I had chills and was pleased with how all of this went down. Demi was back in time to experience group Second Hand High who is a group of a girlfriend and boyfriend from West Covina ages 22 and 26. They were already very proud of their single. So much so, that they have already planned on Simon giving them the go ahead. The pair was engaged, it’s off now, but they don’t seem to be seeing anyone else. Super confidently they went into their song with a very catchy chorus “Hey, you better ask me to dance” which was not very good, but I do give them an A+ for confidence. 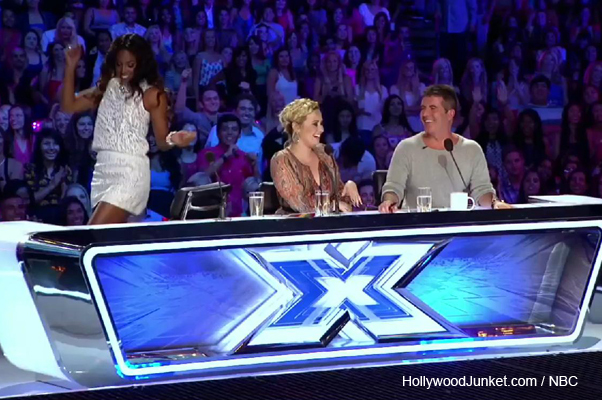 The girl member of the duo asked Simon if he was going to ask her to dance. He yelled “No!” Then Simon told the rapping two “I think you should change the name of the group to diluted. The song was terrible.” It was super entertaining, and they even had Kelly and the crowd up and dancing. I would like to see what they would do next, but on this show it won’t be happening because all four judges said no. During their post interview Second Hand High said their song is going to be a classic. They already had the mentors make their own rendition of it in a shorter version in an X Factor music video which was aired at the end of the show. The most brutal elimination round ever said to come this season. Tomorrow night, the mentors will learn what categories they will be taking on. Night two of week three of “The X Factors” season 3 auditions had Simon saying, “No one’s safe until the end.” Two new changes to the show were announced with one new challenge called, “The Four Chair Challenge” being left as a surprise. The first of the last slew of auditions began with Neal Macomber whose audition was quite scary! 45 year old General Contractor Neal Macomber sang a very flirtatious song to Demi whom he took a liking to. After scaring her half to death and finished-up his song by touching her hair, Simon told him, “It was like something out of a lunatic asylum. If this was a movie it would be like Nightmare on Elm Street.” Simon said he had crazy eyes. It was four “no’s” for Neal. 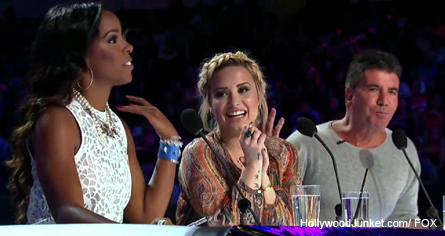 Memorable X FACTOR Moment – Neal scares Demi and caresses her hair! It was a good time of getting through to the next round for groups. A group of three harmonious young girls called GLAMOUR stood before the mentors and sang perfectly. Kelly was so impressed that she said, “I feel like I’m looking at a baby’s Destiny’s Child right now.” The girls were ecstatic. In Los Angeles – GIRLS UNITED is an all girl group ages 24-32 from Los Angeles, Ca said it was the first time they would perform in front of a crowd. All Yes’s for them. Then it was the boys turn. WILD THINGZ consists of two young boys who also scored a Yes vote! Then to round things off, from the Over 25s category, 69-year-old Denny “Santa Clause” Smith from Carson, Ca blew the mentors away with his song, and he went through to the next round. Victoria is a 41-year-old homemaker from Waynesville, MD who is a single mother to eight kids. Her kids ages range from 4-20 years old. She said, “I gave up everything to be a Mom. They’re everything to me.” She separated from her husband, so now she’s a single Mom. 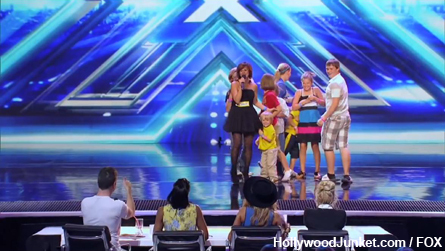 Memorable X FACTOR Moment – Victoria’s 8 kids rushed the stage! Victoria told the mentors she was going to sing “Because of You” by Kelly Clarkson for everything that she’s been through. After she was done, Simon responded, “I genuinely had written you off before you started singing. But I was not expecting that. You had a point to prove. I thought that was extraordinary.” Paulina said, “I felt you love, I felt your pain for your family.” Demi thought it was “unique”, and “I felt your pain through your voice. I’m rooting for you.” After the mentors’ voted “yes”, all of her kids rushed the stage to congratulate her, and the mentors were very pleasantly surprised. 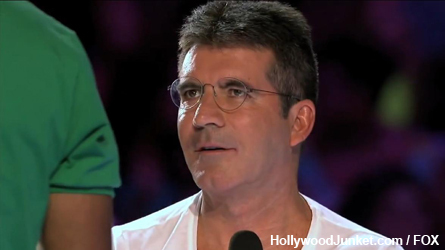 The auditions didn’t finish-up without Simon seeing another familiar face. It was Keith Beukelaer, a 29 year old cashier who Simon encountered ten years ago when he auditioned for American Idol singing Madonna’s ‘Like a Virgin’. At that time, Simon said he was “possibly the worst singer in the world.” Keith said at The X Factor audition that he is still pursuing his dream to be a performer. This time, Kieth sang “Baby Got Back” by Sir Mix A Lot! Memorable X FACTOR Moment – Simon said he also likes big butts, and put Keith through! The women mentors LOVED it so much that they all got up and danced. But Simon wasn’t having it and called the nonsense to a stop. All the mentors said “yes.” Simon said “I also like big butts, so I’m going to say yes.” Keith was the very last audition. There Will Be NO BOOT CAMP! and THE FOUR CHAIR CHALLENGE is Announced! In the next round, the elimination process began where the mentors had to narrow 182 singers down to just 40. They were brought to the Shrine Auditorium in Los Angeles to do so. One of the major changes this season, Simon announced, is that there will be no boot camp. “We are going to now pick ten from each category” said Simon. He also announced that there will be a new elimination round called “The Four Chair Challenge”. Mentors Kelly, Paulina, Simon and Demi took to a private room to review all of the contestants’ auditions once more in order to make their decision of who would stay and who would be leaving. Before Simon announced to the girls who the final ten would be, he said, “This is going to be quite bittersweet.” Later, the mentors found out which categories they would be mentoring by walking into a room with the final ten of their category. Before the end of the show, some the boy and girl contestants that they said ‘no’ to were called back. The mentors placed three boy singers, three girl singers, then three country boy singers to form three separate groups.